Comments: “The ground shakes when he walks!” Earthquake was the high selling, Grand Champion Sim-mental Bull at the 2013 Black Hills Stock Show. 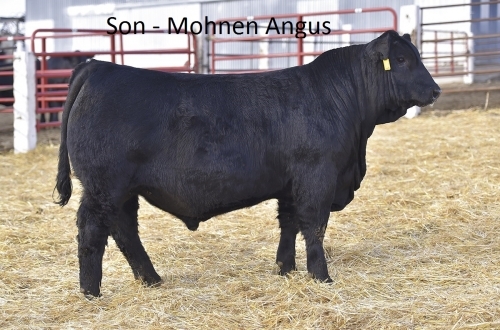 In his first calf crop at Mohnen’s, he sired the $20,000 high selling SimAngus bull . With top 2% WW and top 4% YW, Earth-quake offers breed leading perfor-mance. Cow power and quality is built in with the 3C Melody cow on his bottom side. His first daughters are awesome mamas with perfect teat and udder quality. Earthquake is super sound moving and will add power and performance to your next calf crop!